Copper-covered bays, multi-paned windows, dormers, columns, and a brick veneer bring sophistication to this open, three-bedroom home plan. Step into the skylit sunroom with hot tub from the large master suite or from the great room. An arched window above sliding glass doors floods the generous great room with natural light. Elegant columns open the dining room to the foyer and great room for an airy, open atmosphere. 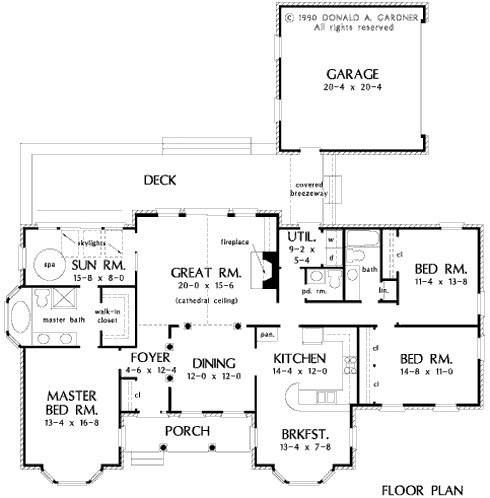 The private master suite features a garden tub, separate shower, double lavs, and walk-in closet, while two large bedrooms on the other side of the house share a full bath. 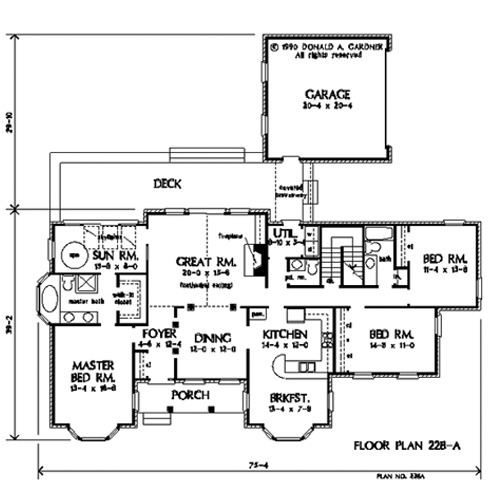 House Dimensions: 68' 4" x 39' 2"
Foyer : 4' 6" x 12' 4" x 8' 0"
Great Room (Cathedral): 20' 0" x 15' 6" x 16' 0"
Utility Room : 9' 2" x 5' 4" x 8' 0"
Bedroom #3 : 11' 4" x 13' 8" x 8' 0"
Porch - Front : 18' 4" x 5' 1" x 0' 0"
Deck / Patio : 43' 5" x 9' 8" x 0' 0"
Other : 15' 8" x 8' 0" x 8' 0"
Other #2 : 4' 0" x 10' 0" x 0' 0"